This past weekend, the short film based on my story Next to Her (aka Avalon) was shot. 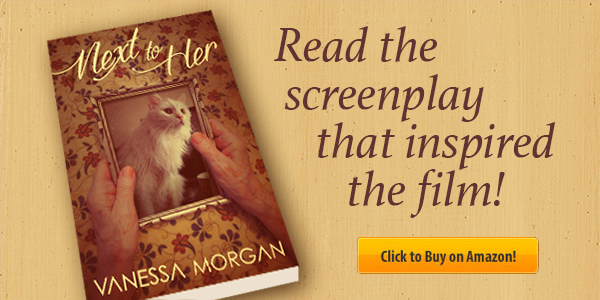 It's the story of an elderly man, Maurice, who visits his wife with dementia at the hospital. 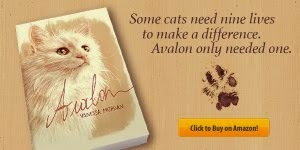 A shared lunch is all they have left, but his wife's thoughts drift off towards the ghost of her cat, Avalon, whose picture sits on the bed stand 'next to her'. As Maurice gets more frustrated with his wife's behavior, the fine line between nurturing and torturing is easily crossed. The majority of Next to Her was lensed at the resident care center Het Heiveld in Sint-Amandsberg, Belgium. It turned out Het Heiveld has a cat: Sheba. 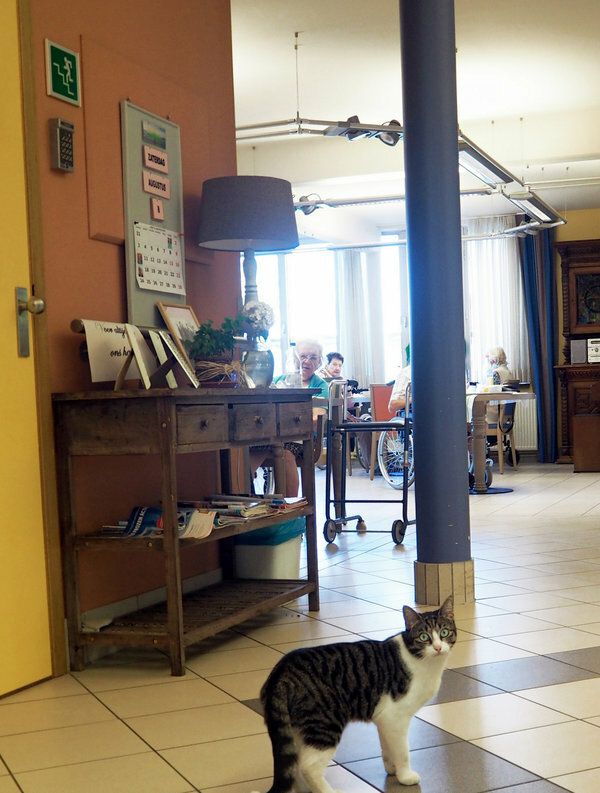 The cat loves to stroll through the hallways, peeps into the rooms, sunbathes in the garden and keeps the elderly residents company in the refectory during lunchtime. His food and water bowls sit together with a small scratching post next to the reception area. By following the cat around, I also discovered he has his own room with an even bigger cat tree. At the refectory is a framed picture of the cat. 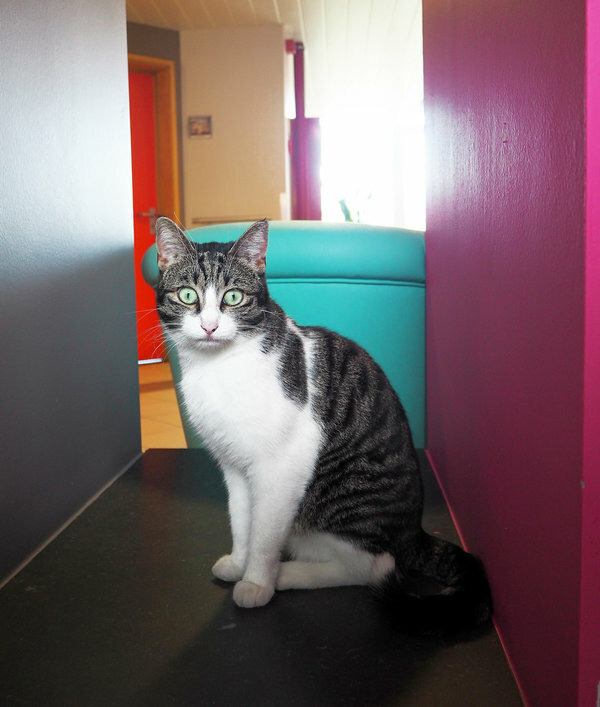 “Sheba is really kind and likes cuddles. We all love him,” one of the residents said. You can read the story on which the film is based here and see pictures of the film set here. Gorgeous kitty. I bet the residents do love a cat that will snuggle sometimes and let them pet him. SO cute!!! Love all the colors in the last two! Is the setting for these photos a nursing home? Aww! what a nice kitty and loves posing heheh! Thank you for sharing on the Oh My Heartsie GIis WW this week. 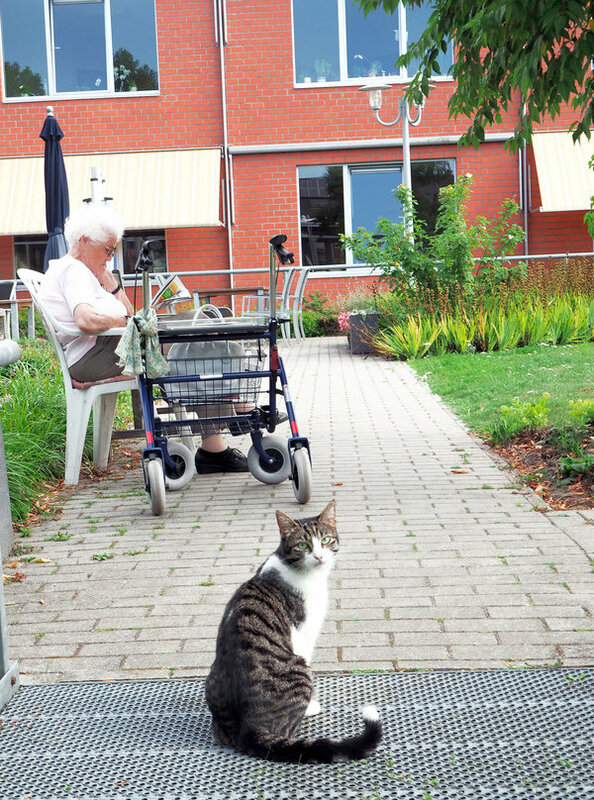 That's really wonderful that the nursing home has a cat, I bet she gets spoiled by all the elderly folks. Oh, such a wonderful nursing home cat! ... and congratulations on your film shooting! I'm sure you're excited - and tired. How exciting the film based on your story was shot. The film set looks great! Sheba is a beautiful kitty! I'm so glad to see a facility like this giving a home to a cat. 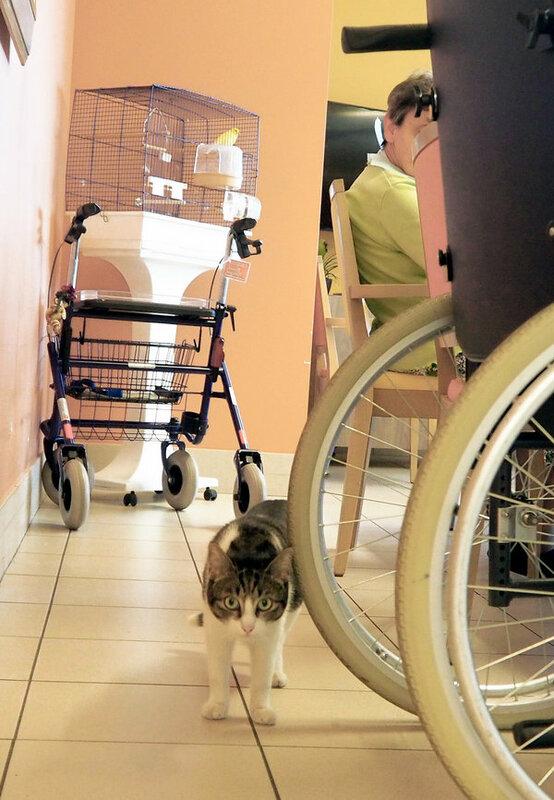 Cats (and other animals) can be very therapeutic for people in nursing homes. Your story sounds very intriguing. Congrats on getting it made into a film! That's a huge undertaking. Your books sounds wonderful and how amazing that is being made into a film. Kitty is cute, too. Sheba is gorgeous. Congratulations on the book and film. 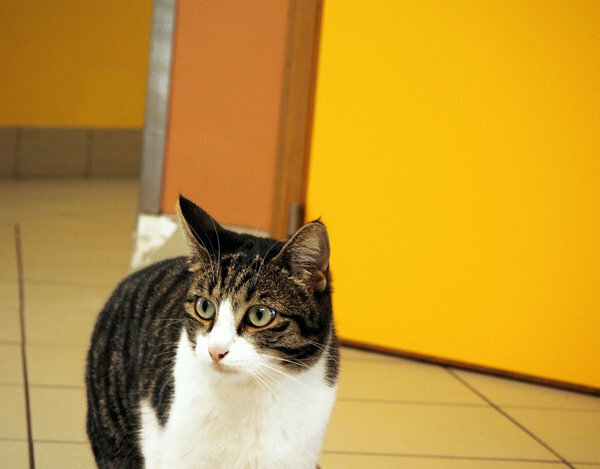 What a big coincidence that the care centre where your story was shot had a cat. Sheba is such a beautiful kitty and the residents must love her company! Awww what a gorgeous kitty! I bet she brings much joy to those residents. She is gorgeous! What a beautiful cat and I love those green eyes. Oh those eyes! What a gorgeous kitty! 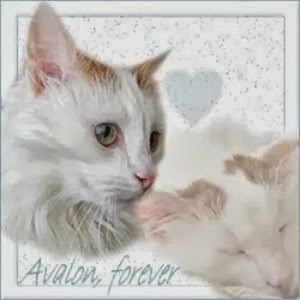 What a lovely cat and story!! Those shots are glorious. So colorful and beautiful! Thanks so much for posting them. We love Sheba's big green eyes! What an amazing story, we can't wait for Mommy to read it to us. We love the photos! Sheba is beautiful. I'm sure he brings lots of joy to the residents. I think Sheba brings lots of smiles and happiness to the people she visits. I visit old soldiers at the VA in my therapy work, but I have to stay on my leash. Lots of my friends there wish I could stay. Such a sweet kitty and we're proud of the job she has, and does so well. Sheba is beautiful, and how wonderful that she has such an important job. What a blessing she must be to the residents! Oh, beautiful kitty.... What a great story. Thanks for sharing at the Weekend Blog Hop (myflagstaffhome.com). Such a beautiful cat! I am so happy he is with those elderly people!